VANCOUVER, BRITISH COLUMBIA, October 5, 2018 – Millrock Resources Inc. (TSX-V: MRO, OTCQX: MLRKF) (“Millrock”) is pleased to report that drilling is in progress at the El Picacho gold project in Sonora State, Mexico. A series of ten holes totaling 2,000 meters has been approved and is being funded by Centerra Gold Inc. (“Centerra”) under an option to joint venture agreement. The program has been designed to test geological targets identified through soil and rock sampling, geophysical surveys, and trenching. The drill holes will test the Placeres prospect, one of several prospect areas identified by the joint technical teams over the past year. The project targets orogenic gold deposits, similar in nature to the nearby San Francisco gold mine, which is operated by Alio Gold Inc. The El Picacho project, located in Sonora State, Mexico, is located approximately 80 km north of the City of Hermosillo, and is accessible by paved highway and gravel roads. Vancouver B.C. — September 26, 2018: Evrim Resources Corp. (TSX.V:EVM) (“Evrim” or the “Company”) is pleased to announce new trenching, rock chip and geophysical results from the Phase 3 exploration program at its 100%-owned Cuale high sulphidation epithermal gold project in Jalisco, Mexico.The new trenches extend the La Gloria outcropping mineralization to the southwest where continuous mineralization remains open, while the Controlled Source Audio-magnetotellurics (CSAMT) geophysical survey confirms at least 200 metres of depth potential directly beneath the trenches.Rock chip sampling has defined a 1,430 metre northwest trend of gold mineralization and confirms a new drill target at the North Dome over 1,000 metres northwest of the La Gloria trenches. Vancouver, Canadá – 22 de agosto de 2018 – Aztec Minerals Corp. (AZT: TSX-V, OTCQB: AZZTF) informa resultados de muestras positivas de hasta 0.47 gpt de oro en 222.0 metros en la línea B del muestreo de canales de roca en carreteras de perforación en el Perspectiva de oro y cobre pórfido de California en la propiedad Cervantes en Sonora, México. During the 20th week of the year (May 14th to May 20th, 2018), at least 17 press releases were announced by companies working in Mexico. Seven companies updated exploration advances, with only one company reporting a quarterly report and one other a round of financing. Two companies disclosed news on resources and development while four reported on deals and company issues. ON MEXICO ISSUES, No relevant news. ON EXPLORATION, In Sonora, San Marco was awarded the Espiritu concession, and Millrock begun a new drilling campaign at La Navidad. In Chihuahua, Endeavour Silver released drill results from its Parral properties; VVC Exploration commenced a new drill campaign at its Samalayuca project. In Coahuila, Discovery Metals presented rock sample results from three prospects within its Minerva project. In Sinaloa, Kootenay optioned the Copalito property. In Jalisco, Evrim commenced a third phase exploration campaign at Cuale. ON MINING, Starcore International presented a quarterly report. ON FINANCING, SilverCrest Metals announced the closing of a $17.25 M financing. Mexus Gold paid a $183 K debt. ON RESOURCES AND DEVELOPMENT, Mag Silver presented an advance on development of the Juanicipio project in Zacatecas. Minera Alamos completed the second phase of bulk leach testing at its Santana property in Sonora. ON DEALS AND CORPORATE ISSUES, Marlin Gold and Golden Reign signed a LOI pursuing a business combination. Kootenay Silver optioned the Copalito property in Sinaloa. Argonaut Gold informed on the state of affairs of the legal battle to resume blasting at its La Colorada mine in Sonora. Leagold received clearance from the Mexican government to complete a business combination with Brio Gold. Endeavour Silver Corp. disclosed drilling results from its Parral properties in Chihuahua. At the San Patricio vein system 8,846 m of core drilling have been completed over 1400 m of strike length. “Three mineralized areas were intersected, of which the largest and central zone now measures 600 m long by 250 m vertical (starting 150 m deep) by 1-3 m true thickness, still open to the south and at depth”. Highlighted true width (TW) intercepts include 2.1 m @ 303 g/t Ag, 0.05 g/t Au, 0.4% Pb, 0.5% Zn; 1.0 m @ 678 g/t Ag, 0.22 g/t Au, 3.5% Pb, 0.9% Zn; 3.0 m @ 689 g/t Ag, 0.24 g/t Ag, 1.6% Pb, 1.1% Zn; 1.6 m @ 293 g/t Ag, 0.27 g/t Au, 3.5% Pb, 7.6% Zn; 2.3 m @ 1,660 g/t Ag, 0.72 g/t Au, 6.5% Pb, 14.4% Zn. Metallurgical recoveries from core samples with flotation and leaching tests include 47% Ag from Sierra Plata (oxide), 98% Ag on El Verde (mixed), 95% Ag on Remedios-Argentina (mixed), 94% Ag and 93% Au on Palmilla (oxide) and 91% Ag and 86% Au in Cometa-San Juanico (mixed). San Marco Resources Inc. announced it was awarded the Espiritu 2,712 ha SMR concession in the recent mineral concession lottery by the Mexican government. The property is less than 30 km SE from San Marco’s Chunibas and 1068 projects in the Sahuaripa district. “Espiritu SMR overlies a window of pre-mineral cretaceous volcanic and sedimentary rocks intruded by Laramide age granitoids”. Previous operator in the area, Kootenay Silver Inc. stated: “An extensive area of polymetallic vein, stockwork, breccia and gold-copper porphyry mineralization”. A porphyry copper setting and a vein and stockwork zone of precious and base metal mineralization are separated by a major fault. Selected drill hole intercepts include 48.0 m @ 0.19 g/t Au, 0.1% Cu; 220.5 m @ 0.14 g/t Au, 0.15% Cu. San Marco is preparing to do a first-pass ground validation and prospecting. VVC Exploration Corp. commenced the third phase of diamond drilling at its Samalayuca copper project in Chihuahua. VVC expects to drill about 3,000 m in the next 180 days. Kootenay Silver Inc. optioned the Copalito project in Sinaloa (See below). “The Copalito Project covers a gold and silver epithermal vein system comprised of numerous veins, with individual veins currently traced over strike lengths up to 2 kilometres. Veins vary in width from 0.5 to 10 meters at surface and grade from background to highs of 7.2 gpt gold and 1,620 gpt silver in grab samples”. Vein textures indicate a low or intermediate sulfidation vein system. Millrock Resources Inc. is beginning a second round of drilling at its La Navidad project in Sonora. The target in the project is orogenic gold mineralization, bulk mineable run-of-mine oxidized deposit. The 1,650 m program aims to drill 150 – 250 m in depth in seven holes, testing areas of gold soil anomalies that now are supported by gold anomalies in trenches. The strongest anomalies occur in folded, faulted metasedimentary rocks of Jurassic age, in close proximity to diorite and monzonite dikes. An induced polarization survey has identified low angle structures conducive of orogenic gold deposits. A 1.4 km of trenching on 16 trenches has been completed, with multiple intervals of anomalous gold, like 18.0 m @ 0.56 g/t Au, 24.9 m @ 0.32 g/t Au, 18.2 m @ 0.20 g/t Au, 10.9 m @ 0.38 g/t Au. Evrim Resources Corp. commenced a third phase exploration at its Cuale high sulfidation project in Jalisco. The program includes 3,000 m of drilling, following on discovery trenches 1 to 4 from La Gloria zone, where trench 1 returned 1.67 g/t Au over 263.7 m and trench 4 returned 13.61 g/t Au over 106.2 m. “The soil survey has already commenced and will be followed with up to 650 metres of trenching at La Gloria and surrounding targets to extend the known footprint of outcropping gold mineralization”. A 40 line-km controlled source audio-magnetotellurics (CSMAT) is planned on potential mineralization under shallow cover. A 3,000 m program is expected to commence on July. Discovery Metals Corp. disclosed assay results of 152 samples from its Minerva project in Coahuila. “Minerva encompasses Ag-Pb-Zn mineralization hosted in skarns, mantos, chimneys and breccias”, similar to La Encantada mine 30 km to the East. 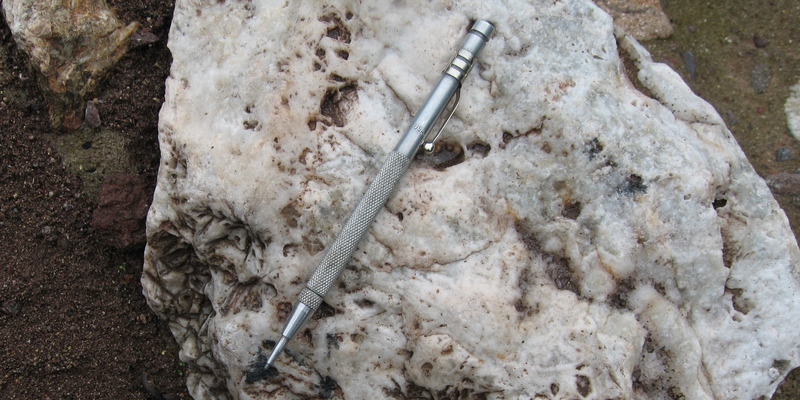 The mineralization is located along the margin of a polyphase granitoid intrusive body, with ample zone of shallow gravel cover. At La Tercia prospect, channel samples returned 0.8 m @ 30 g/t Ag, 2.3% Pb, 4.6% Zn; 2.0 m @ 249 g/t Ag, 6.9% Pb, 0.1% Zn; 4.0 m @ 37 g/t Ag, 1.6% Pb, 0.2% Zn; 0.6 m @ 3.8% Pb, 0.4% Zn; 0.6 m @ 84 g/t Ag, 5.8% Pb, 0.2% Zn. At Concordia samples returned 0.8 m @ 1,775 g/t Ag, 14.5% Pb, 40.3% Zn; 0.7 m @ 51 g/t Ag, 2.6% Pb, 0.4% Zn; 0.4 m @ 11 g/t Ag, 0.4% Pb, 25.8% Zn. At Mina Minerva results include 5.1 m @ 39 g/t Ag, 0.4% Pb, 2.0% Zn; dump @ 229 g/t Ag, 30.5% Pb, 5.7% Zn; 0.8 m @ 143 g/t Ag, 9.7% Pb, 5.3% Zn; 1.0 m @ 41 g/t Ag, 2.0% Pb, 16.4% Zn. Starcore International Mines Ltd. announced production results for the fourth quarter of its fiscal year 2018. During the quarter 71.9 K tonnes of ore @ 1.69 g/t Au, 40.6 g/t Ag were processed on its San Martin mine in Queretaro, resulting in the production of 4,140 Oz AuEq. Mill recoveries averaged 88.4% Au, 57.4% Ag. Also during the quarter the Altiplano facility received 373 tonnes of concentrate containing approximately 805 Oz Au and 26,813 Oz Ag. SilverCrest Metals Inc. completed its prospectus offering for gross proceeds of $17.25 M, including the exercise of the over-allotment option in full. The company paid the underwriters a cash commission of up to 6% of the gross proceeds of the offering. The proceeds are to be used on the preparation of a preliminary economic assessment (PEA) at the Las Chispas property in Sonora, as well as continuing exploration in the several targets it contains. Mexus Gold US. announced the payment of $183.3 K due to JMJ Financial, closing the current outstanding debt agreement prior to the expiration date (8 Hermanos, Sonora). Mag Silver Corp. presented financial results for the first quarter of 2018. Underground development rate has intensified, and exploration drilling is now utilizing directional drilling to infill and expand the Deep Zone, which remains open to depth and on strike. The company funded advances on the Juanicipio project in Zacatecas, mainly by “cash calls” by the operator (Fresnillo PLC). At the end of the period the company had $152.7 M in cash and cash equivalents. Minera Alamos Inc. has completed the second phase of its bulk testing heap-leach activities at its Santana project in Sonora. The initial phase used coarse crushing (<3”) and the second phase involved fine crushing (<1.2-5/8”) and agglomeration of the same mineralized material prior to leaching. The recoveries from the second phase were faster and consistent with those of the first phase of leaching, with 190 Oz Au recovered from 9,000 tonnes of material over a three month period, representing 0.65 g/t of recovered gold. Marlin Gold Mining Ltd. and Golden Reign Resources Ltd. entered into a non-binding letter of intent (LOI) together with Wexford Capital LP, pursuing a business combination of Golden Reign’s San Albino-Murra property in Nicaragua, and Marlin’s La Trinidad mine in Sinaloa. Golden reign plans to acquire all Marlin shares. Upon completion of the transaction Marlin shareholders will own approximately 45% of Golden Reign shares, while Golden Reign shareholders will own 55% of the shares. Kootenay Silver Inc. entered into an option agreement to acquire a 100% interest on the Copalito Ag-Au project in Sinaloa. The seven concessions 3,700 ha project can be acquired by making staged payments over a 4-year period, totaling US$985 K, with the vendors retaining a 0.5% NSR. A finders fee of C$10 K and 100 K common shares have to be paid. Argonaut Gold Inc. reported that the Judiciary court hearing with respect to the company’s explosives permit for its La Colorada mine has been rescheduled to June 4, 2018. The company also appealed the Judiciary court’s original decision to temporarily suspend the explosives permit to the Collegiate Tribunal, requesting to re-instate the explosives permit so the company can blast material while the judiciary legal process continue. Argonaut estimates it has sufficient ore to continue operations until the end of July, at the present rate of 12,000 tonnes per day (tpd). On the picture above, opaline silica from a shallow epithermal system in Guanajuato. Picture by Jorge Cirett. VANCOUVER, BRITISH COLUMBIA, May 16, 2018 – Millrock Resources Inc. (TSX-V: MRO, OTCQX: MLRKF) (“Millrock”) is pleased to report that a second round of drilling is beginning at the La Navidad gold project. The project, located in Sonora State, Mexico, 100 km north of the City of Hermosillo, targets orogenic, bulk mineable, run-of-mine, oxidized deposits that could be processed by heap leaching. Exploration work is being funded under an option to joint venture agreement by Centerra Gold Inc. (“Centerra”). The core drilling program will consist initially of 1,650 meters in seven holes, ranging from 150 to 250 meters in depth. These holes will target the large, strong, gold-in-soil anomalies previously identified at the Cobre and Crossover prospects. Recent trenching has confirmed bedrock gold mineralization at surface in these prospect areas. Additionally, at least one hole from the initial program completed in late 2017 will be deepened to test for further mineralization at the Anchor prospect. Results of that program were reported in a prior press release here. Contingent upon results of the upcoming drilling phase, the drilling program may be extended. released on receipt. The Company intends to complete a gravity survey in the near future and plans to drill test anomalous targets during May, 2018.
and continued surface sampling and reverse circulation drilling on new discoveries in the recently staked CLM West claim group.